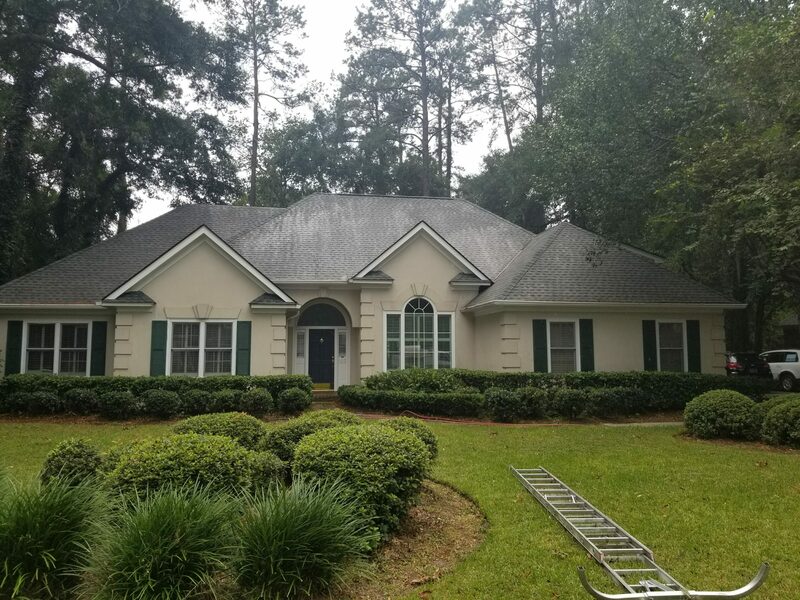 Roof Cleaning Wilmington Island GA: Last week was a breath of fresh air for the roof cleaning side of our pressure washing business. We secured three roof cleaning jobs in one week. 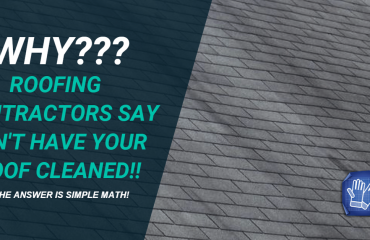 I know you are saying that does not seem like much but it has been an uphill battle trying to educate our potential clients that their asphalt shingle roofs can safely be cleaned. 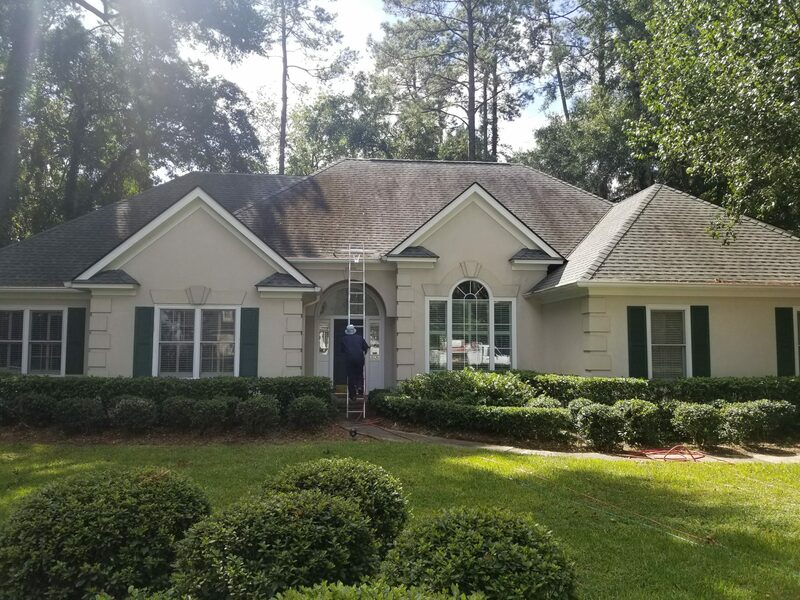 Today we’d like to show off one of our three roof cleaning projects from last week completed in the town of Wilmington Island, Georgia. 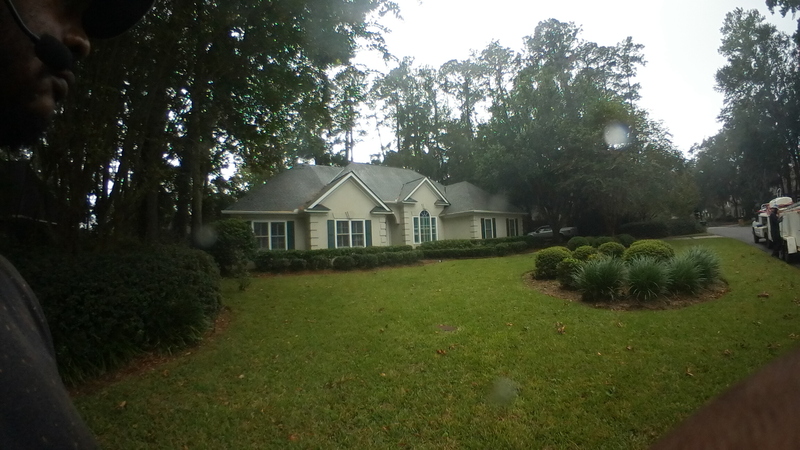 This roof was covered in unsightly dark streaks on the asphalt shingle roof. 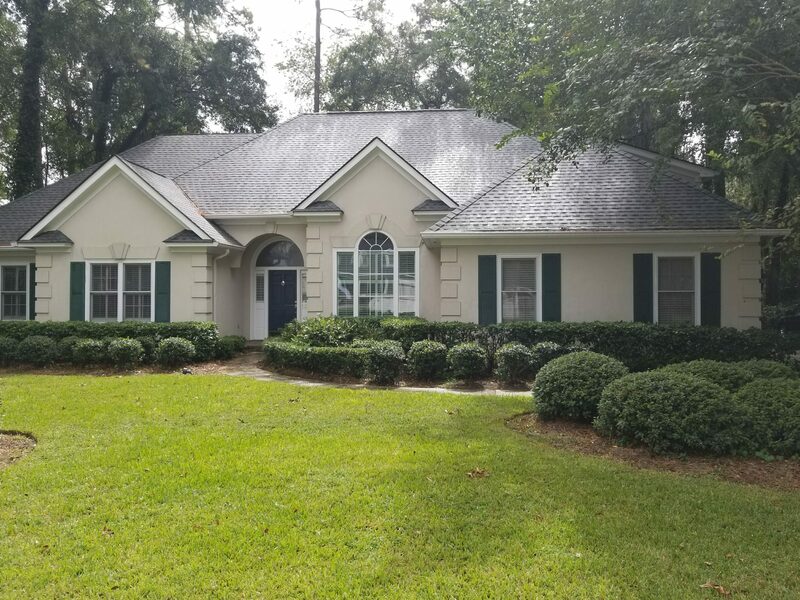 Though often attributed to an accumulation of dirt, defective shingles, mold, or mildew; the most common culprit is actually a blue-green algae known as Gloeocapsa Magma that is spread by airborne spores. 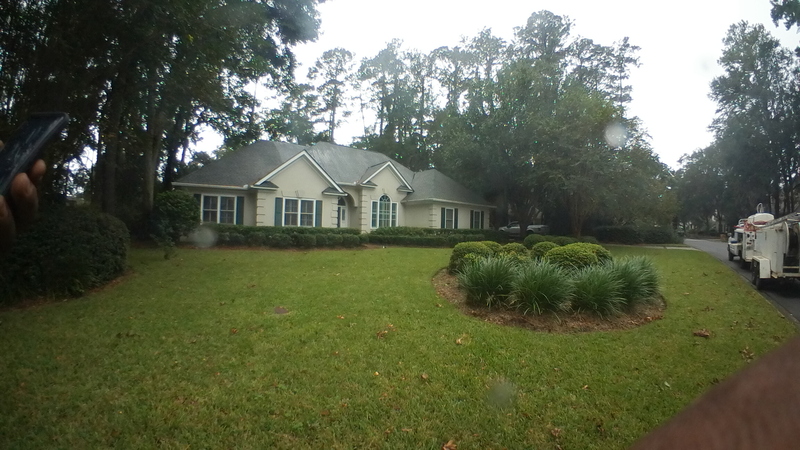 After careful research on Google for low-pressure (soft washing) the homeowner found pressure cleaning services contractor to clean the home. This was a roof wash only job. 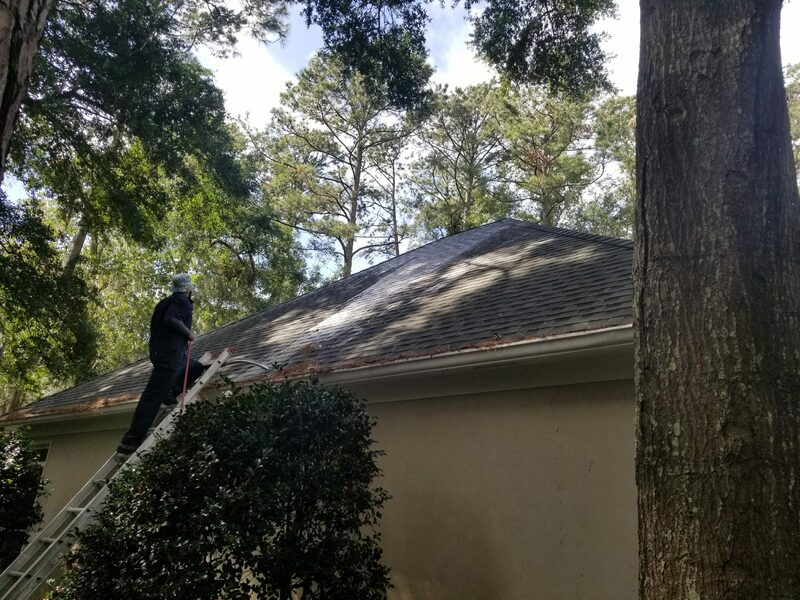 We offer full-service pressure cleaning, but the client opted for the roof cleaning only. 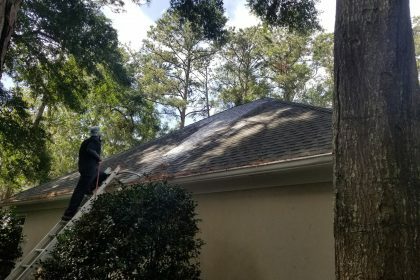 Roof cleaning is a never done with a pressure washer. 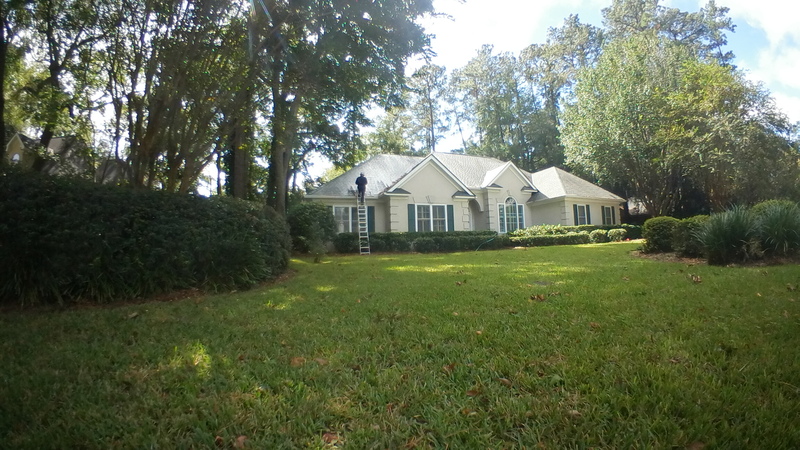 We use special low-pressure chemical applicators to apply our roof cleaning chemicals. 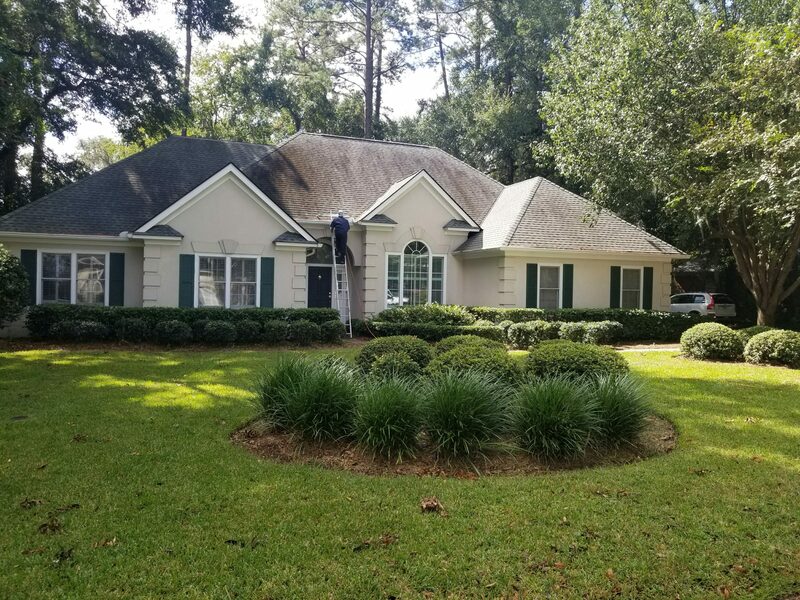 Since the house roof was free of rust stains and other specialty cleaning needs, it only had the normal algae and dirt which is common for roofs in the Wilmington Island area. 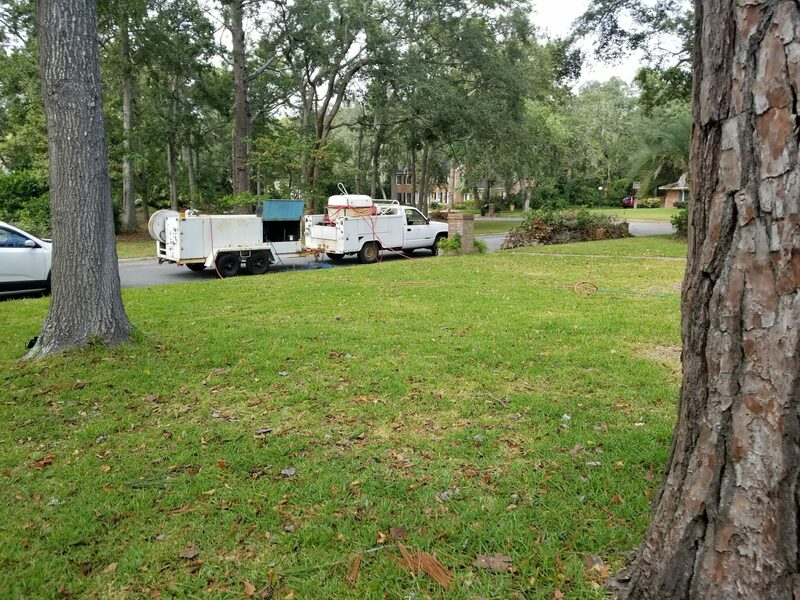 f you need an experienced Wilmington Island, GA roof cleaning services contractor ready to handle all types of pressure cleaning services, call (912) 988-3832. 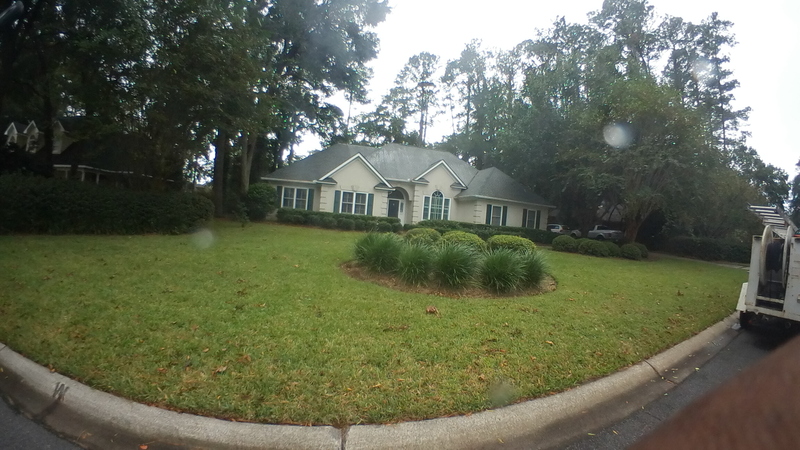 We’ll be happy to assist you with your house washing, roof cleaning, and power washing services needs. 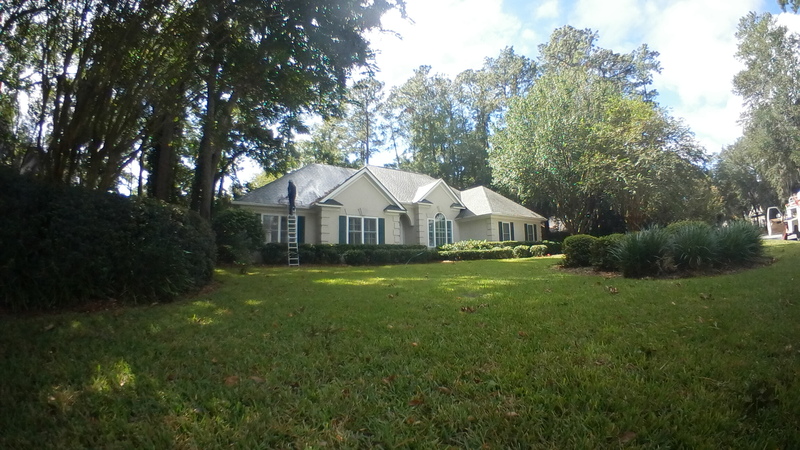 Need A Reputable Roof Cleaning Services Contractor In Wilmington Island, GA? 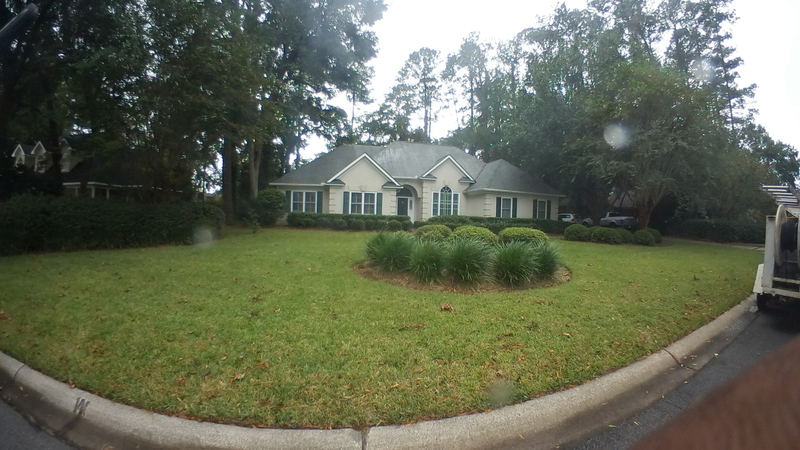 A dirty house can greatly affect your curb appeal, so it’s critical to address any problems right away. 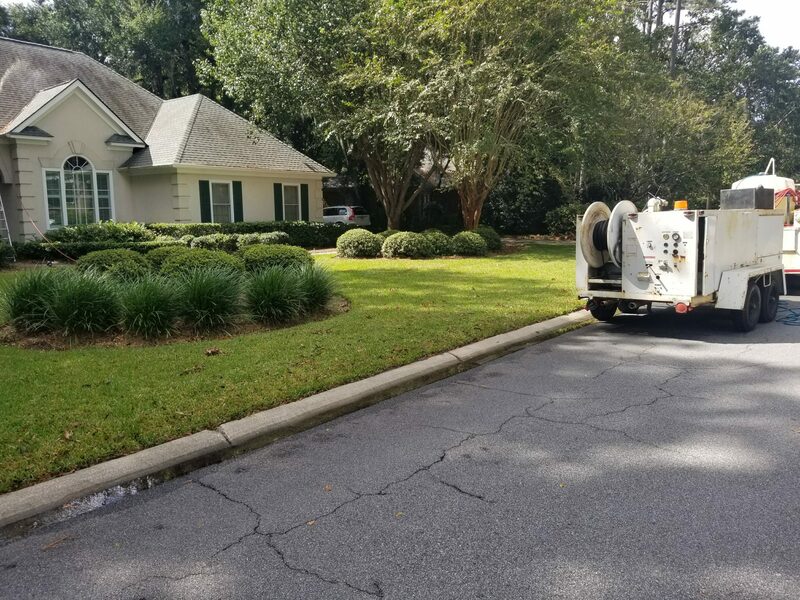 If you’re looking for a contractor with pressure cleaning services expertise, consider Chatham Property Maintenance, a family owned & operated Wilmington Island, GA pressure cleaning contractor experience. 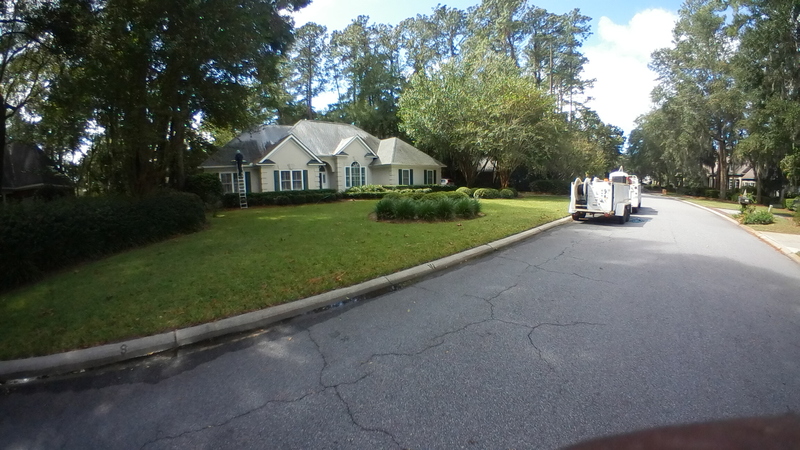 We are fully licensed and insured pressure cleaning contractor to do pressure cleanings in Pooler, GA. 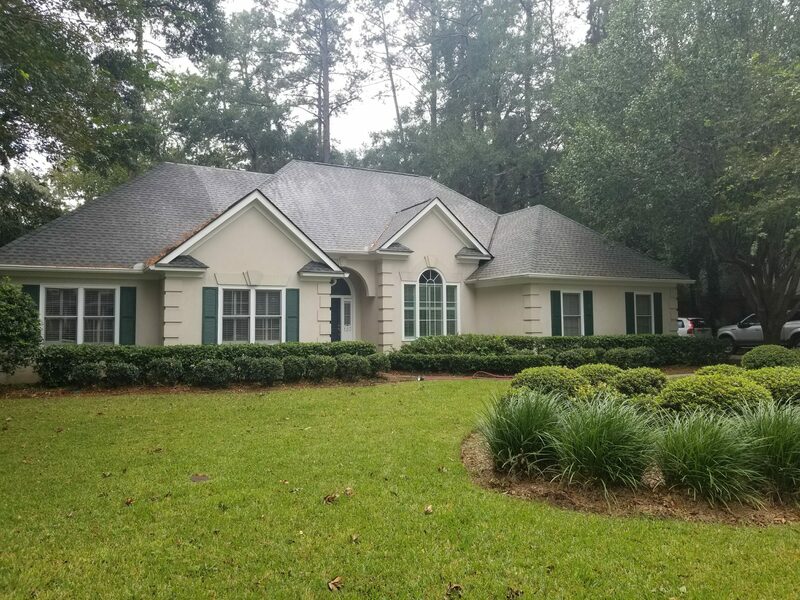 Call our office today at (912) 988-3832 to request your Free Estimate or to learn more about how Chatham Property Maintenance can help you remove those black streaks!